STOCKTON -- Allison Duncan, #20, of San Rafael won the Western Late Model main event for the second time this season at Stockton 99 Speedway on Saturday night. "I worked so hard for that," said Duncan from victory lane. Duncan started the race up front next to #6, Gary Shafer Jr. of Stockton. Shafer jumped into a quick lead and held it through two cautions until lap 19. 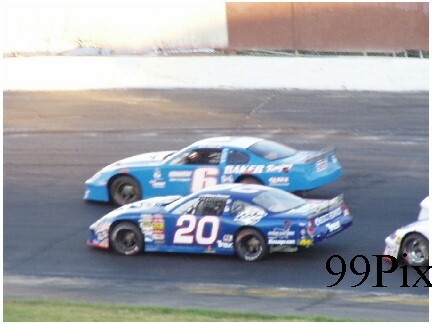 On the 19th lap restart, Shafer and Duncan again lined up side by side, but before the drivers made it to turn two, Shafer lost control of his car and landed on the turn two wall. Shafer Jr. then headed into the infield and didn't return. On the restart ,Duncan opted to start on the outside next to teammate John Moore, #27, of Granite Bay. After racing side-to-side with Moore, Duncan led the rest of the way. Moore finished second, Pete Anderson Jr. of Stockton was third, Arron Shankel of Lodi finished fourth and Todd Corral of Modesto was fifth. American Limited Stock Car driver #99, Donny Darter set a second consecutive qualifying record of 15.634 seconds and then won a caution filled 30-lap main event. Milpitas' Ron Robeck swept the Pro-4 Trucks division, setting fast qualifying time, winning the trophy dash and main event. Jay Linstroth, #10, of Citrus Heights won a very fast 50-lap Main Event in the Grand American Modified Division. STOCKTON -- For the second time this season San Rafael's Allison Duncan won a HAVOLINE Western Late Model main event. "I worked so hard for that," said Duncan from victory lane. And work hard she did. 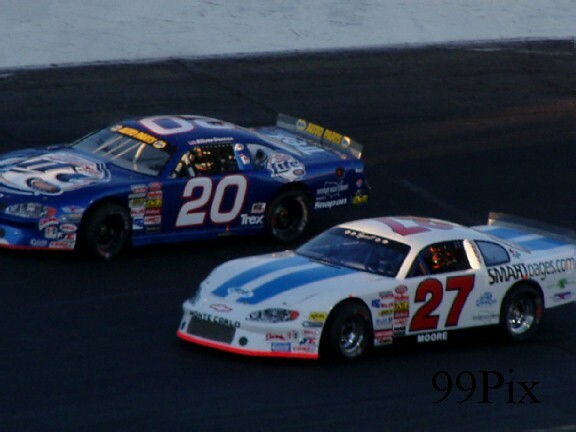 The NASCAR Drive for Diversity program driver started the race up front next to Stockton's Gary Shafer Jr. Shafer Jr. jumped into a quick lead and consistently held off Duncan through two cautions to lap-19. On the lap-19 restart, Shafer Jr. and Duncan again lined up side by side, but before the drivers made it to turn-2 Shafer Jr.'s car lost control on its own and landed on the wall. Shafer Jr. then headed into the infield and didn't return. On the restart Duncan got her first clean shot at taking the lead, but she had to take it by getting out in front of one of the track's most consistent front-runners, her teammate John Moore of Granite Bay. She opted to start on the outside, and after an intense lap of door- to-door racing alongside Moore, she gained the lead and held it to the checkered flag. "I knew my Miller Lite car was better on the top," said Duncan, of her choice to restart on the outside. Moore finished second in the NASCAR DODGE Weekly Series Div. II premier event, Stockton's Pete Anderson Jr. came in third, Lodi's Arron Shankel finished fourth and Modesto's Todd Corral rounded out the top five. Qualifying runs, the dash and main event finishes shook up the Western Late Model points race. Moore's second place finish was enough to push him to the top of the division leader board, where he now sits with 526. Anderson Jr. moved down one place to second with 523 and Duncan is now only 11 points out of first with 515. The tight 11-point spread between the top three could change completely with the coming double points night Saturday. The 1,277 fans in attendance got to see CL BRYANT American Limited Stock Car driver Donny Darter set a second consecutive qualifying record and then won a caution filled 30- lap main event. Darter started the race in the fourth position and gained the lead by lap-3. Although he was challenged for the lead at times, in the end the Stockton driver scored a commanding win. Rounding out the top five were Stockton's Joe Allen at second, Lodi's Jeff Ahl at third, Manteca's Marc Borges at fourth and Manteca's Mike Brooks Jr. at fifth. Darter's win and record setting run was far from the only ALSC action that fans got to see Saturday. Rather than just the usual qualifying runs, dash, B-main and main, track officials added four six car heats and a door-to-door to the night's show. Darter's new qualifying record is 15.634. 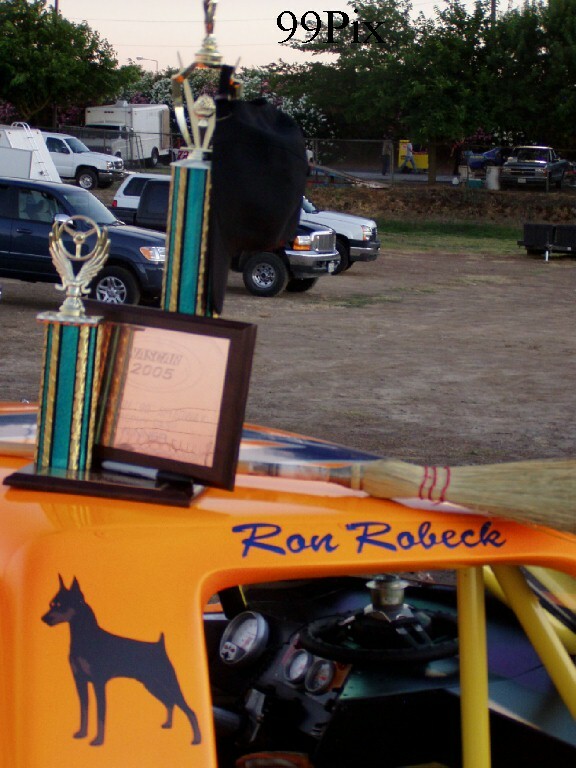 In Pro-4 Trucks racing Milpitas' Ron Robeck swept the division. After checking in with the fast time and winning the dash, he started the 25-lap main event in the third position, took the lead on lap-6 with an outside move in turn-3 around Nathan McNiel and held it through to the end. Lathrop's Mark Henslee finished second, McNeil finished third, Hayward's Walt Bruegger came in fourth and Ripon's Tim Fernandes Sr. rounded out the top five. After a few weeks off the Grand American Modified drivers were back on the track for the second 50-lap main of the night and Citrus' Heights Jay Linstroth led from start to finish. There were a few cautions in the race, but Linstroth maneuvered easily around them and never had a problem regaining the lead on restarts. Modesto's Kyle Gottula took second, Stockton's Chris Mays took third, Modesto's Mike Beeler came in fourth and French Camp's Tony Noceti rounded out the top five. 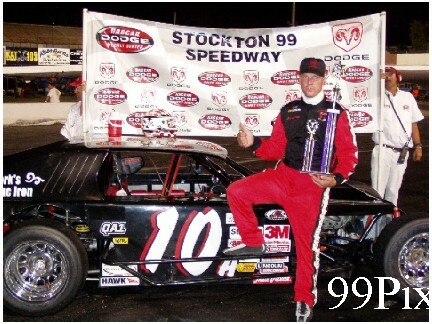 Stockton 99 Speedway is fast becoming a popular place to race for drivers from other areas. Saturday night Pleasanton driver Brian Koski joined the WLM field for the first time this year and Russ Cazier came all the way from Gardnerville, NV, to run in the GAM race. Mark your calendars! On Saturday, July 16 the NASCAR AUTOZONE ELITE DIVISION SOUTHWEST SERIES "AUTOZONE STORES STOCKTON 125 BY HAVOLINE" will be at Stockton 99 Speedway! CL BRYANT will be there handing out free cases of HAVOLINE motor oil to fans that buy family packs, and race fans can go to any local AutoZone store and get a $5 discount coupon for the event. In addition to the 125-lap race, the HAVOLINE Western Late Model Drivers, CL BRYANT American limited Stock Car drivers, Pro-4 Trucks and California Mini Racing Association Mini Cups. the WLM, ALSC and Trucks will be running for double points! Don't forget, parking at Stockton 99 Speedway is always free!